Is it possible to be both a honky-tonk and a dining destination? 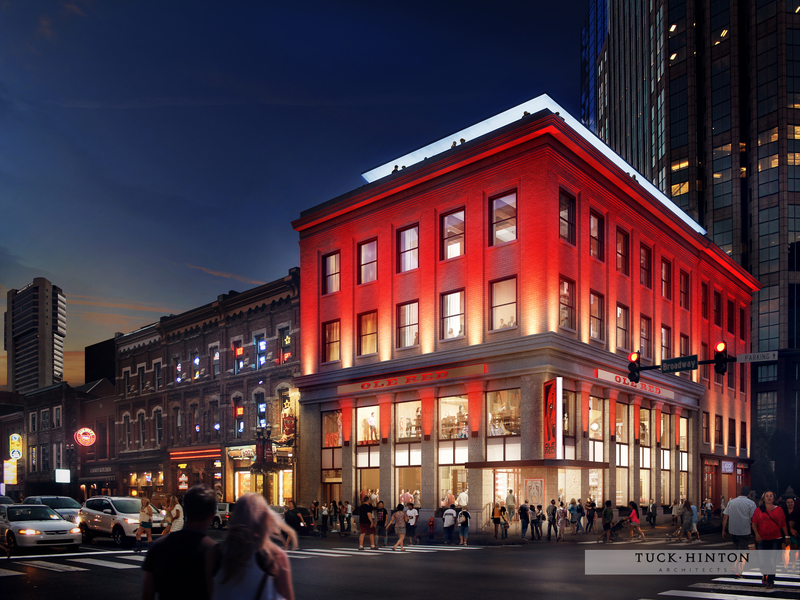 The Blake Shelton-themed Ole Red nightclub on Lower Broadway hopes so. During preview parties this week, the venue hosted press mavens, social-media tastemakers, music-industry folks and radio leaders to sample its visual, audio and taste delights. In our V.I.P., roped-off zone on the mezzanine, we sipped something called a Tishomingo Sunset, which involved habanero whiskey, orange moonshine, grenadine and soused cherries. Appetizers included burger sliders, fried pickles, raw oysters, BBQ pork sliders and shrimp-salad toast points. The décor was “country eclectic.” I noted both a stuffed buffalo head on a wall and an upside-down red tractor suspended from the ceiling. Next, we were escorted up to The Hall at Ole Red on the third floor. This is a beautifully lit, spacious event space that can be decorated to suit. Here, we were welcomed by Lisaann Dupont, the director of communications for Opry Entertainment. Ole Red is located on the site of the old Opry gift shop at 3rd Ave. & Broadway. “We’re glad you guys came out to see what we do here,” said executive chef Garrett Pittler. “Our menu is what I call ‘upscale honky-tonk food.’” Pittler was previously with the Omni and Loew’s Vanderbilt hotels and with City Winery. Our dinner menu featured home-style servings of collard greens, mashed potatoes, poutine on “housemade” tater tots topped with a fried egg, pickled cauliflower, biscuits with apple butter and kale salad. The attendees were particularly enthusiastic about the fried broccoli with corn meal and parmesan cheese. The venue’s signature dish is “champagne fried chicken,” so-named because the chicken is marinated in the “the champagne of bottle beers,” Miller. I sampled a wing and a drum. Our next stop was The Lookout, the venue’s fifth-story rooftop bar. This is where desserts were served. The “donut wall” was hung with dozens of different circular concoctions. The Lookout’s décor is gleaming, sleek, metallic and modern. What’s more noteworthy is its height, surely the tallest on Lower Broad. We overlooked the Bridgestone Arena, the Nissan Stadium, the Country Music Hall of Fame and the Seigenthaler pedestrian bridge, where Kathy Mattea was shooting an album cover photo with manager Marc Dottore in tow. The Lookout’s signature cocktails were/are the Honey Bee with gin, honey, lavender and lemon, as well as Cumberland Punch, involving rum, pineapple liqueur, combier, orgeat, angostura bitters (I never heard of these things either) and lime juice, plus an edible orchid. 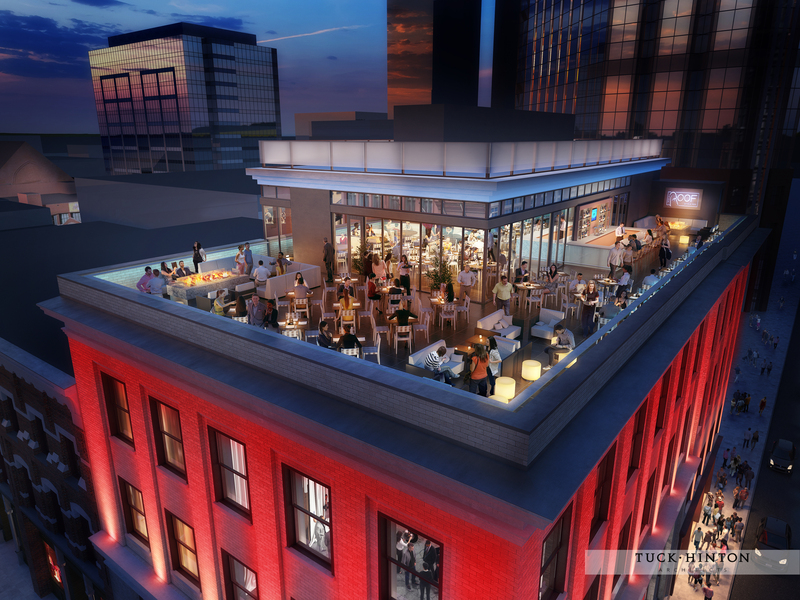 The 26,000-square-foot Ole Red Nashville is billed as a “highly anticipated partnership between Ryman Hospitality and Opry member Blake Shelton.” It will officially open during the CMA Music Fest, June 6-10. The star will be there on the 6th, following the CMT Awards, in a “Blake Shelton and Friends” concert. Tix will be distributed via a contest for fans. There is a previous Ole Red in Toshomingo, Oklahoma, Blake’s hometown. There is a future one (planned for 2019) in Gatlinburg. The Nashville location is in the heart of a district that also features honky-tonks and/or eating establishments branded by Dierks Bentley, Alan Jackson, John Rich, Florida Georgia Line, George Jones and B.B. King. Next up will be a Jason Aldean joint, slated to open across the street from Ole Red. Good luck with that.